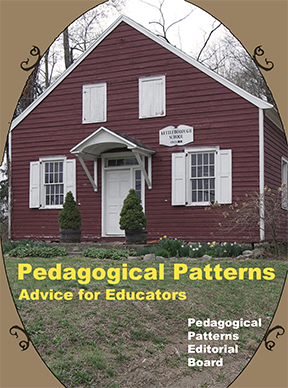 Finally we've published our collection of Pedagogical Patterns - our advice for educators! Patterns are designed to capture best practice in a specific domain. Pedagogical patterns try to capture expert knowledge of the practice of teaching and learning. The intent is to capture the essence of the practice in a compact form that can be easily communicated to those who need the knowledge. Presenting this information in a coherent and accessible form can mean the difference between every new instructor needing to relearn what is known by senior faculty and easy transference of knowledge of teaching within the community. In essence a pattern solves a problem. This problem should be one that recurs in different contexts. In teaching we have many problems such as motivating students, choosing and sequencing materials, evaluating students, and the like. These problems do recur and in slightly different form each time. Each time a problem pops up there are considerations that must be taken into account that influence our choice of solution. These forces push us toward or away from any given solution to a problem. A pattern is supposed to present a problem and a solution. The problem together with the forces must apply to make that solution beneficial to the problem. A pattern language is a set of patterns that work together to generate complex behavior and complex artifacts, while each pattern within the language is itself simple. The patterns community has begun to realize that patterns in isolation provide only incremental improvements to software systems, organizations and processes. Pattern languages, on the other hand, promise to drive fundamental and lasting improvements. One very successful pedagogical pattern language is Seminars by Astrid Fricke and Markus Voelter (see Example Patterns). It describes how to design and deliver a short course. Little in this language (or any pattern language) is novel, but it brings together in one place expert knowledge that is often forgotten and sometimes overlooked. A number of educators have been involved in the pedagogical patterns project for several years. There is this international web site with contributions, including some of these. Contributions are eagerly sought and members of the community are happy to work with new pattern authors to develop their work.